I am just like any other 29 year old woman. I enjoy makeup. I love putting it on and feeling pretty. I’m not going to lie, I don’t wear it often. Most days I’m thankful to get a shower, brush my teeth, and put on some tinted moisturizer. But at least once or twice a week I put on my face so to speak. My makeup style has always been less is more. Nothing extravagant, just doing my best to enhance what my momma gave me. 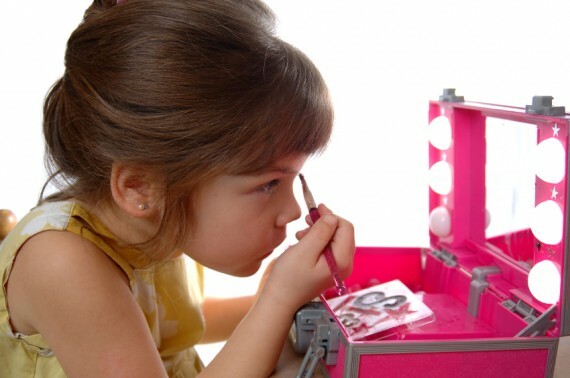 So, it has been overwhelmingly shocking that my five year old is obsessed with makeup. Most of the time when I put mine on, she is not around. Although she has watched a time or two, it’s something I usually do before she wakes up. Again, it’s mind boggling to see her be so obsessed with it. She pretends to wear some every day. That aisle at Target that sells the tween aged makeup junk makes her giddy. She wants a huge makeup case with all of the colors of the rainbow. And sparkles, she wants lots of sparkles. I just wonder where she gets all these ideas from. I monitor her television, I know she doesn’t see it there. As I already said, I barely wear any. Ninety percent of her friends are little boys, so I’m guessing that they aren’t influencing her. Thankfully, when you ask her, she will reassure you that she doesn’t want makeup to make herself feel pretty. (This child lacks no amount of self esteem, she thinks she is beautiful already!) She just enjoys the bright colors and creativity of the whole process. Even though I know that her motives are innocent, I have opted no on the whole makeup scene, pretend or play makeup included. I just feel there is no need to rush her into that whole culture just yet. She is still my little girl after all.